The selection of the U.S. to be the partner country for Hannover Messe 2016 underlines the importance of the digitalization as one of a basic direction in the modern industry. Company ROCON as regular exhibitor at this world most important industrial trade fair follows this tendency with the whole its portfolio. Visitors will be able to learn all about the company main activities and especially for the achievements in the Digitalization of the Substation Protection & Control systems. 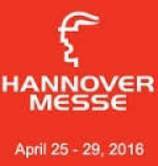 All this information will be available from April 25 to 29, 2016 in Hall 013 stand B70 at the HANNOVER MESSE.